If you are interested in web design or developing, being involved in reseller web hosting is a good way to increase your income, as well as your range of provided services. This is a field you have probably heard of, and below we will make sure to present it in detail and answer any of your inquiries, in order to help you see the potential in such a decision! Let’s start from the basics. In a nutshell, a hosting reseller rents hosting packages from companies that provide web hosting services at wholesale prices and then resells them to the public. Reselling is technically and essentially easier than setting up web hosting from the start. However, it requires a basic level of technical knowledge and the ability to offer customer services and support. You focus on sales and basic support. The company you have selected to provide packages at wholesale prices is responsible for the maintenance of servers, software and bandwidth. 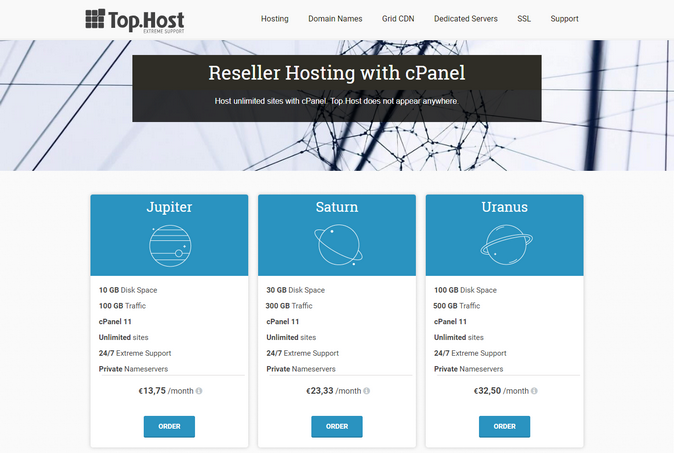 At Top.Host, we do not offer our Resellers just that. We take on the challenge of providing our customers with the fastest hosting experience, along with the privilege of their brand appearing at reseller hosting (rather than ours). 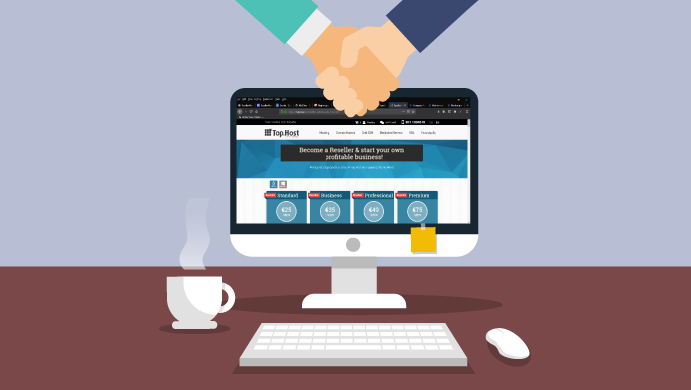 In addition, we offer myTophost Backup to all our packages, including those of reseller hosting. This ensures absolute speed and flexibility in Backup & Restore procedures for their files and data bases! Is it worth it, financially-wise? If all that sounds like a good idea, then you must be wondering if this is all worth it, financially-wise. The truth is that you determine the reselling price, therefore you choose the profit margin. 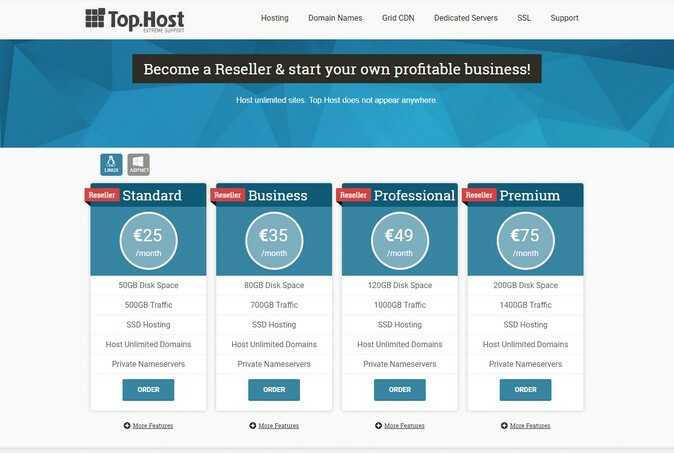 At Τop.Host, Standard reseller package offers 50GB disk space and 500GB traffic, costing €25/month – 300€/year (+ VAT). There is the option of adding unlimited domains – however limited space of 50GB respectively limits sites. Let’s assume that 30 sites that have been recently launched, small sized and with limited traffic, can function properly. You can find an average price from the large companies offering web hosting packages, but you cannot really compare to them in terms of competitiveness. Let’s determine an average price for what you offer at €35/year. In case your customers exceed 30-50, which can be covered by the Standard package, you may instantly proceed to a package upgrade and expand the disk space available. But it’s a good start, till you gather your desired number of customers. What choices are there in packages? At Τop.Host, there are two categories for reseller packages, related to the platform used to manage the package. These are the ready-made packages that require minimum technical knowledge and guarantee 24/7 Extreme Support from our team, when you need it. You don’t have to be especially knowledgeable when it comes to your customers. The company you will do business with is a cornerstone, when you begin providing web hosting services. The initial provider that rents space for you to resell is essential. It is important to establish trust and safety every step of the way and feel that way over time. Good support guarantees that, which is why Τop.Host has raised the bar high. In any new partnership there is a meeting/acquaintance with the company’s people. Here in the digital world we have created the video below, in an attempt for you to come one step closer to Top.Host’s philosophy and values. I encourage you to see it (turn the subtitles on! ), so that you meet the people working behind this website! My brother is one of these people, talking about his favorite topic: food. ← How to add custom CSS to your WordPress website? Why elastic hosting is best for your site?